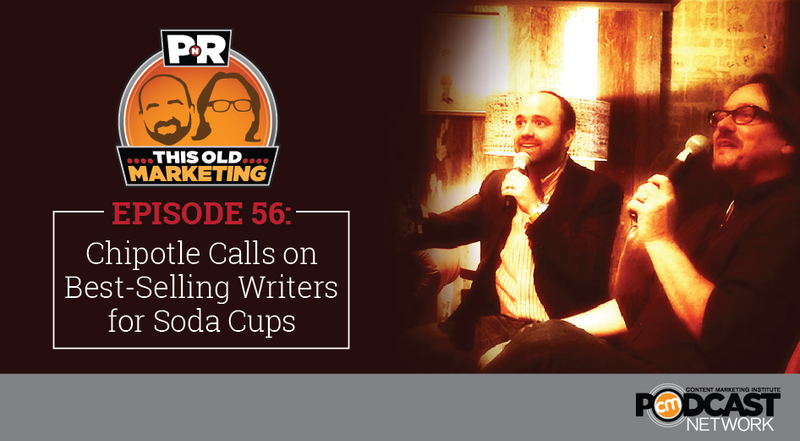 In this week’s episode, Robert and I talk about the latest research on content marketing spending. Is 25% not enough? 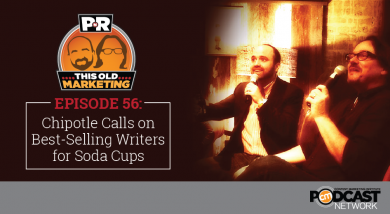 Audio content begins to go viral, and Chipotle delivers compelling experiences by adding short stories from best-selling writers to its bags and cups. Robert and I dig Digiday’s “What’s In and What’s Out for 2015” list, which aligns with many of our predictions. Rants and raves include my rant about an unclear native advertising spot on Conan O’Brien’s late night show and Robert’s rave about the convergence of user experience and storytelling. We wrap up the show with a #ThisOldMarketing example from Rockwell Automation. Content Marketing Remains a Fraction of Budgets (3:56): Ad Age reports on the results of a survey by Contently, which says budgets for content marketing have yet to catch up with the hype surrounding the practice. Robert and I have some issues with this article, which implies that content marketing budgets are very small. Twenty-five percent of a Fortune 500 marketing budget is actually quite large. Several statistics quoted from the Contently survey don’t quite match up with the research we’ve done at CMI, but Robert and I suspect it has to do with a wide variation of respondents to Contently’s survey. Did You Hear? Going Viral is No Longer Just for Videos (11:28): This article from NPR highlights the growing trend of viral audio, and cites several recent examples. NPR questions whether these audio successes are flukes or a sign that audio clips are growing in popularity. Robert and I discuss the value of using classic content formats in new ways to create engaging experiences. Robert believes we’re entering the “golden age of content,” and he explains why. Got a Best Seller? Chipotle May Come Calling (20:15): The New York Times reports on Chipotle’s “Cultivating Thought” content initiative, for which it commissioned 10 writers to author original short stories to appear on its food bags and cups. This terrific content initiative got its start when author Jonathan Safran Foer approached Chipotle’s CEO about using its “surfaces” to provide thought-provoking and engaging “gifts” to its customers. Robert and I discuss how content marketers can adopt this line of thinking to provide a unique experience to their customers. Content Discovery – Quality vs. Quantity (26:52): A growing number of publishers are trying to figure out the best way to keep visitors on their websites: presenting the reader with numerous options for related content, or more of a minimalist approach? Folio magazine presents two case histories of recent site redesigns that take dramatically different approaches: PopularScience.com and Slate.com. Although this article is about user experience design, Robert and I agree that it contains some excellent lessons for content marketers. What’s In and What’s Out in Content Marketing (33:40): Digiday has published an entertaining and informative list of What’s In and What’s Out for 2015. It’s paired with commentary from Michael Brenner via B2B Marketing Insider. Brenner appreciates the thought that went into Digiday’s introduction to the list, which contains what he calls the best paragraph on content marketing he’s read all year. Robert and I agree that it brilliantly sums up the blurring of the lines between publishers and brands that’s happening today. This Old Marketing is sponsored by Acrolinx, which builds enterprise linguistic analytics software that helps brands intelligently translate and manage their content in multiple languages. 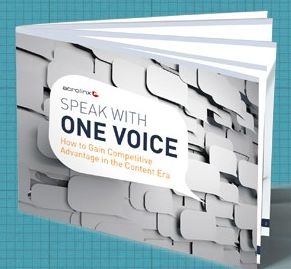 Acrolinx is promoting a new eBook called Speak with One Voice: How to Gain Competitive Advantage in the Content Era. It answers questions such as how can you make your content stand out? And, how should companies align their marketing and technical content so they speak with one voice to their prospects and customers? This eBook answers these questions, shares best practices for creating great content, and points you to technology that can help streamline the process and make it more efficient. You can register for it at http://bit.ly/pnr-acrolinx2. Joe’s Rant: Late night talk show host Conan O’Brien and his sidekick Andy recently did a skit where they pretend that an unscrupulous merchant has stolen a sweater Andy bought for Conan as a present. Conan chides Andy for not using PayPal. That’s right – it’s a native ad placement, embedded in the show. This just felt wrong to me, perhaps because it was unclear if it was an ad or not. Robert’s Rave: Robert really likes an article Adam Kleinberg recently wrote for Ad Age entitled Storytelling and User Experience Are on a Collision Course. It explains how rising consumer expectations are driving marketers to integrate storytelling and user experience and outlines the benefits of doing so. Robert loves how it elegantly ties these two concepts together and connects them with customer needs and expectations. Rockwell Automation: Automation Today, Asia Pacific is a 24-page magazine produced by Rockwell Automation. It provides readers with articles on automation technology and interesting applications of the company’s products. Staff at Rockwell’s Milwaukee headquarters produces the content for 16 pages of each issue, and then sends the publication to its regional offices in Australasia, who add localized content to fill the other eight pages of each issue. This enables the company to create a highly focused print publication that is tailored to the customers and needs of each region.